So I was on the train to work there and it was mobbed, even at midday. I could see a couple of seats but one was next to a bloke who was clearly going to talk mince. The other one was next to a woman in her 30s with an unironed face, drunk hair and fur around her lips. 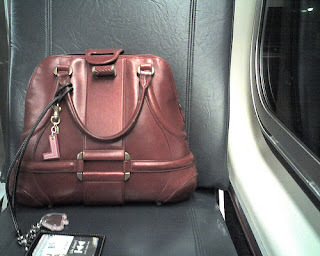 Her off white, oversized handbag was guarding her from the comfort of its own seat, my seat. "Did your bag buy a ticket madam," I said as she continued to outstare space. "Only I have," I continued as I ignored her ignoring me in a frenzy of ignoring. I picked up the pampered handbag and passed it to her with a sweet smile that would offend Beelzebub. "I think you may have misplaced this," I said. "Who do you think you are? How dare you?" she said. "Don't mention it," I said. "It was no bother," I replied, ignoring the metaphysical debate about self. Others in the vicinity tuned in. "How rude, could you not have sat somewhere else?" "Too lazy to walk down the train and look more like," she insisted. I'm like an anger eater me. I feast on it. "You got me," I said. "Hey ho." I then upped the anti. "Is your bag animate? Why is it not on your lap, are you ashamed of it? You could sit it on your lap and stroke it with uncontrolled malevolence and cackle every now and then. You would likely find the entire table becomes yours." "You're pathetic," she said. "You're so rude. You need to get a life." "When your bag gets a life and buys itself a ticket then I will. You tell me where to get this life you speak of and I'll tell your bag about the ticketing system. "Until then here we are, me without a life and your bag without a seat. Why doesn't your bag find another seat? If you're so ashamed of each other you could maybe do with the break. "In fact, if your bag can find me another seat then it can join me for the rest of the journey to Glasgow while you come to terms with how you treat it." "F**k off," she said, my work was done. It was timed well as a pregnant lady got on at Paisley and I offered up my seat to go find someone else to fight. I said goodbye and good luck to the bag and wandered off to the sound of giggles and sat next to the bloke I didn't want to earlier, safe in the knowledge that he knew better now than to say anything at all. Public transport is such fun. Why do people assume putting their bag on a seat makes them and the seats invisible to other train users. It works sometimes as I see folk walking past or standing, too shy to offend. Not me, am a vigilante ready to strike at the heart of this selfish arrogance. Bring your anger to me, am hungry.